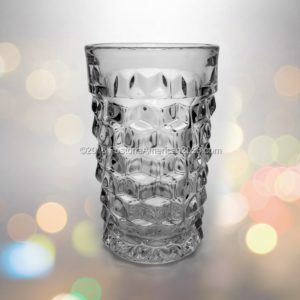 There are a variety of “Ice Tea” glasses in the Fostoria American pattern. Some of the glasses are footed and/or flared, one has a handle, and the one pictured in this post is the Ice Tea – Regular. Most versions hold approximately 12 oz., so the real differences between them can be found in their design and shape. Whether footed, flared, or regular – all are equally beautiful. The 12 oz. Ice Tea – Regular – has a height of approximately 5”. It has straight sides and does not have a foot. 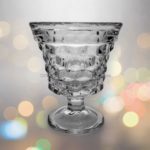 If you are interested in purchasing the many varied Ice Tea glasses in the Fostoria American pattern, please click the following sponsored link for available Ice Tea glasses on eBay.